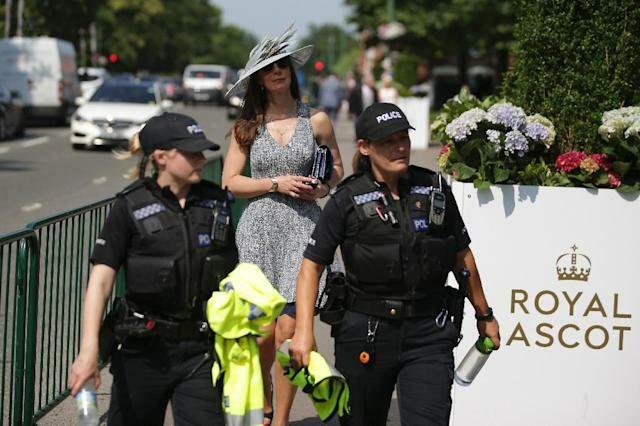 London (AFP) - Tipsy racegoers could face being barred from entry to Royal Ascot next week as the authorities are introducing breathalyser tests in a bid to avoid some of the unsavoury scenes witnessed at other meetings this season. The authorities have acted to prevent the meeting -- which is attended by Queen Elizabeth II and other members of the Royal Family -- falling prey to the mass brawls that occurred at Ascot and Goodwood in May. They are also introducing more than 20 sniffer dogs who will seek out people in possession of illegal drugs, drugs amnesty boxes, increased "visible" security and ending the practice of mobile alcohol sellers or "beer hawkers". Ascot hopes it will "pre-empt incidents arising from excess alcohol consumption or other anti-social behaviour" at perhaps the most glamorous racing carnival in the sport which gets under way next Tuesday and runs until the Saturday. "The use of illegal drugs and their contribution to anti-social behaviour is a significant issue for all major events," Ascot chief executive Guy Henderson told the BBC. "This year we will continue proactively to address these challenges with an increased specialist security team, supported by more visible stewarding around bar and other areas in order to pre-empt incidents arising from excess alcohol consumption or other anti-social behaviour." Those showing signs of being intoxicated will be breathalysed at the point of entry and turned away if they fail a test whilst those who are caught in possession of illegal substances will also be barred or expelled from the course. A highly visible response team trained and equipped to carry out early intervention and evictions, will be increased to more than 100, aided by trained spotters. Dogs will patrol key areas across the site including entry points outside the course, public bars and queues for the lavatories and car parks whilst there will be the usual armed police presence on and off the venue. Fighting broke out at Ascot in May, a week after police said around 50 people were involved in "multiple altercations" at Goodwood.